Boys Varsity Basketball · Apr 1 Congrats Joe! 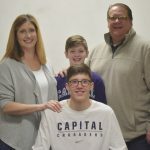 Congratulations to Joe Thompson for signing to play collegiate athletics at Capital University! Boys Varsity Basketball · Feb 14 Thank you Seniors! Thank you Joe, Ben, Cade, Scotty, Conner, Brendan, Kyle and Mike for 4 great years!